And yet almost all business and success literature is still written for men dispensing advice that doesn't take into account women's unique strengths or address the demands of family life on mothers. Think and Grow Rich for Women is a powerful new book from the award-winning author of Think and Grow Rich: Three Feet from Gold and coauthor of the multimillion-selling Rich Dad, Poor Dad. It combines Hills classic Thirteen Steps to Success with case studies of noteworthy women (including Sandra Day Connor, Maya Angelou, Katie Couric, Caroline Kennedy, Madonna, Oprah Winfrey, Margaret Thatcher, Condoleezza Rice, J. K. Rowling, Barbara De Angelis, Marianne Williamson, Angela Merkel, Mary Kay Ash, IBM CEO Ginni Rometty, and many more), outlining a master plan for success for all women. You have in your hands the book that can change your life and make it infinitely better NOW! Women are the best teachers and mentors of other women to be all you desire to be, do all you desire to do, have all you want to have, and inspire others to do the same or more. Drink deeply of this wisdom shared by some of the most brilliant women on the planet. Use the principle of sharing by giving this book to all the women that you love and care about. Sharon Lechter goes about her work with passion. 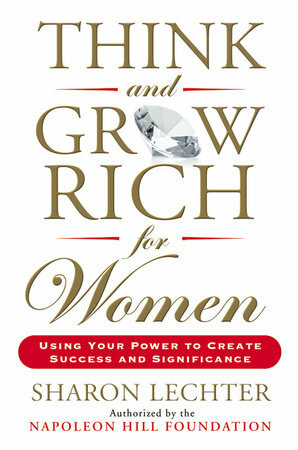 Think and Grow Rich for Women is simply a book that needed to be written for todays woman to help her grow and serve others. For anyone with a daughter, niece, granddaughter, sister or friend who needs a primer on how to work hard, dream big, and lead a life filled with adventure, possibility, and financial responsibility, this is the book for you. I loved it. "Ideal for anyone beginning a career or needing a jump start." As a successful entrepreneur, philanthropist, and catalyst, Sharon Lechter mixes wisdom from women through the ages with her own powerful experiences to map a road to success. Keys to success identified by Napoleon Hill over seventy-five years ago enjoy a make-over this time for women! This wonderful, uplifting, and highly practical book gives you the most famous and successful formula for personal achievement ever discovered. "The books focus on women and a plethora of inspirational quotes from successful women (the only man Lechter quotes directly is Hill) makes a wonderful change from the male-dominated voice in similar titles. In addition to worksheets helping readers form their own strategies, Lechter guides readers through the program, focusing on faith (religious and otherwise), the acquisition of knowledge, and the importance of imagination and persistence. Female Hill fans will be glad to see a book that acknowledges their ambitions. As a successful entrepreneur, philanthropist and an international change-maker Sharon Lechter combines the wisdom and insights of women throughout the ages with her own powerful experiences to shed light on the road to success identified by Napoleon Hill over 75 years ago- but this time for women! I can only imagine Napoleon Hill doing the Ã¢â‚¬Å“happy dance in Heaven when he reads what my dear friend has written to not only carry on his powerful work but revealing the undeniable importance of all women! In this book, Sharon hits the nail on the head and shatters the old myth that men are supposed to be more successful than women and also shatters the Ã¢â‚¬Å“glass ceiling" stigma that has held women back from financial and total life success. If you are looking for a book to read that will inspire your being and move you to achieve your biggest goals Think & Grow Rich for Women is the answer! The world of business is a much better place as even more women have become wildly successful entrepreneurs and business owners. The Napoleon Hill Foundation and one of the most brilliant individuals on the planet, Sharon Lechter, have created the perfect book for the next generation of global entrepreneurs. Sharon has a gift to bring out the best in everyone around her through her words, thoughts, and actions. The insight and wisdom that is shared in this book is exactly what every aspiring entrepreneur needs to read to understand specifically what it takes to succeed in life and business! Thank you for the brilliant gift! I believe that Think and Grow Rich for Women is the right book and written at the right time to bring Napoleon Hill science of personal achievement to millions of women. It is destined to become a classic for all women with desire to realize their potential. This book is going to impact the lives of millions of women all over the world and, rightly so, as the principles that both Napoleon Hill and Sharon write about are universal and will work for everyone everywhere. Any woman who makes the content of this book a part of her way of thinking, a part of her way of life, will accomplish every objective that comes to her mind. Sharon Lechter is an author, CPA, the founder/CEO of Pay Your Family First, and a publishing powerhouse. In 1997, Lechter coauthored the international bestseller Rich Dad, Poor Dad and fourteen other books in the Rich Dad series. In 2008, the Napoleon Hill Foundation tapped her literary genius and together they have produced two bestselling updates of Hills work, Think and Grow Rich: Three Feet from Gold and Outwitting the Devil. Her most recent bestseller, Save Wisely, Spend Happily, was released in 2013 in partnership with the AICPA.